This granola might just be one of the most versatile recipes I've shared on this site, and ha, it's not even mine! Go figure. But when I got the chance to share it I couldn't pass up the opportunity. 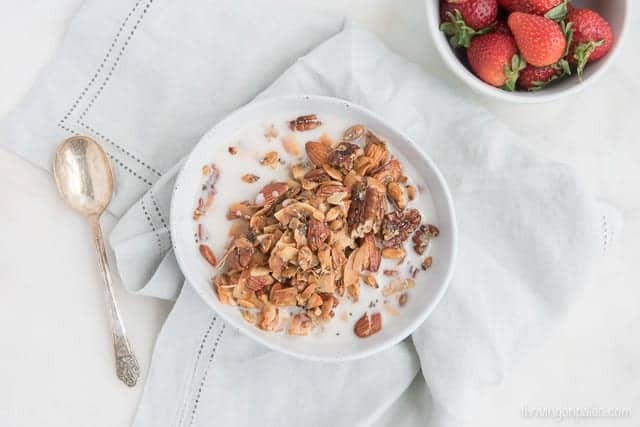 This granola recipe is from a new cookbook called Real Food, Real Simple by a blogger named Taylor Riggs. She's the blonde beauty behind Simply Taylor and now a Registered Dietitian Nutritionist, which means she knows a lot of stuff about food and how it can affect your health. Taylor, though, has lived with Type 1 diabetes since she was diagnosed at the age of 10. When she got to college she learned about the Paleo diet and was able to stabilize her blood sugars and take less insulin using Paleo foods. 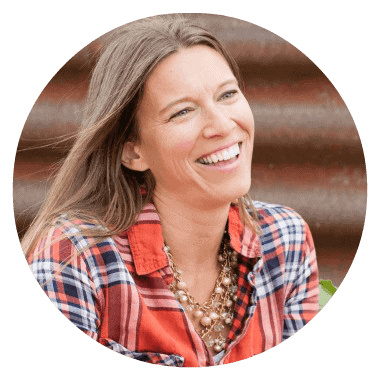 She started a blog, (back then was Taylor Made It Paleo) and shared delicious Paleo recipes with the world. That's actually how I knew her – I've followed her since like sometime in 2012 and have enjoyed watching her figure out her way in this world. (Listen to me, I'm 40 and I sound like an old grandma… oh my, how that young lady has grown… geez). 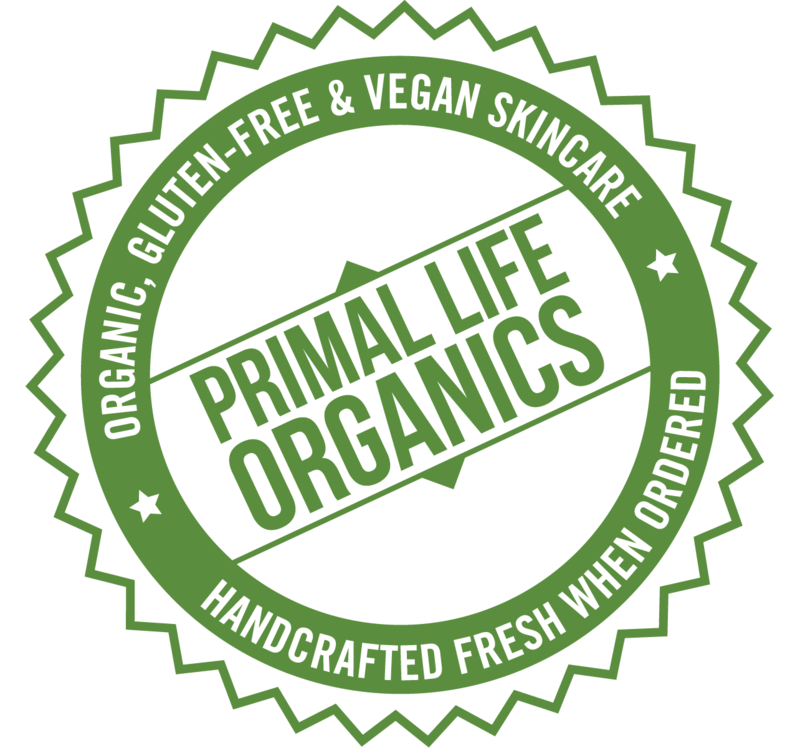 Anyway, she switched her blog name when she realized that she could eat certain “non-Paleo” foods like cheese and some gluten-free foods, which I completely applaud and encourage everyone to try. I myself keep trying but not having much success in that area, but I think everyone should see what works for them. The rest of her book isn't fussy either though. All mostly Paleo (with a few optional cheeses scattered about), gluten-free, and all stuff that can easily be done on a weeknight with relatively few ingredients. Just an example of some of the other recipes: Sriracha Cauliflower Poppers, Mexican Fiesta Skillet, Sweet Potato Noodles with Kale, Onion, and “Cheese” Sauce, Cranberry Orange Scones, and Fruit Pizza with Coconut Cream Spread. Beautiful pics to go with each recipe as well. If you want just a book full of healthy, simple dish ideas, this is a good choice. This granola is such a versatile recipe and it's Paleo, gluten-free, grain-free and oat-free. Perfect as a snack, breakfast or topping. Preheat the oven to 300 F. Combine the coconut flakes, nuts, seeds, and salt in a large bowl. Add the coconut oil, honey, and vanilla and mix until the nuts and seeds are evenly coated. 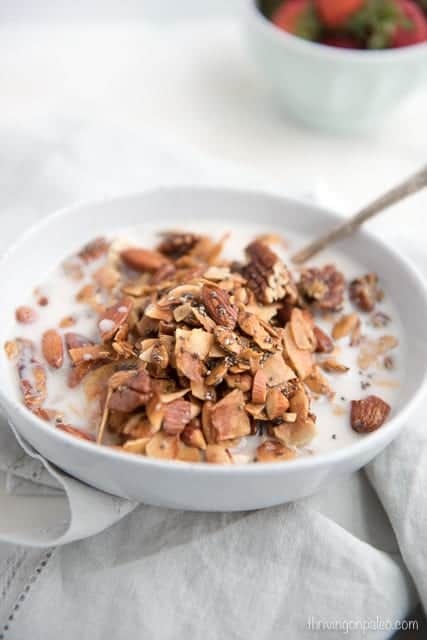 Arrange the granola in a thin layer on a large baking sheet lined with parchment paper and bake for 12-15 minutes, or until the coconut flakes turn golden brown, tossing halfway through. Taylor says you can sub any nuts/seeds you'd like in this recipe. She's tried multiple combinations and has yet to find one she didn't like. Michele's note: I can see adding some cinnamon or pumpkin spice into this recipe as well to give it a wonderful different flavor, so see how versatile this can be? Different nuts/seeds or different spices and you could have this so many times and not get sick of it. That is so easy! What a great, simple recipe. One of my little ones (the toddler type of course) is perfectly giddy about any sort of granola – I’ll have to make this for her! It IS so easy. I had it in my head for some reason that grain-free granola had to take a long time. Glad to know I was wrong! Looks so good! 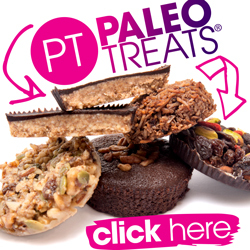 I used to have cereal all the time (pre-paleo) and I miss it like crazy – this would definitely do the trick! Thanks! At what temperature should this be baked? Thank you for such a great recipe! Oh my, that would probably be important, eh? Sorry about that! It should be at 300 F. I fixed the recipe above too. This looks and sounds delicious! Homemade granola has been a favorite of mine for years, but I always forget to make it. Thanks for inspiring me to make some of this. Yum! I always forget to make it too! But this is so easy that I hopefully can just pop it in the oven when I need it. Sounds like a book I need on my shelf! Thnk you for sharing. Making this granola stat! It’s a great book! Made dinner from it last night and the whole fam loved it. My boyfriend brought home some granola the other day with 40g of sugar in it, sigh. This looks way more up my alley. I love this recipe. It’s simple yet practical for everyday use. Thanks for sharing ! My kids are always asking for granola. This recipe looks perfect!! This looks like the perfect breakfast or snack to enjoy! A not too sweet granola! Perfect for the breakfast table. I am going to make this lovely treat this week. Thanks for sharing. Oooh I love the sound of this grain-free granola! I always love the fact that heaps of honey hasn’t been added in like in other recipes. Yummy! Love grain-free granola!! This version looks great!